Parents can enjoy decorating their son’s bedroom to reflect his personal taste, interest and personality by choosing a cool wallpaper mural. 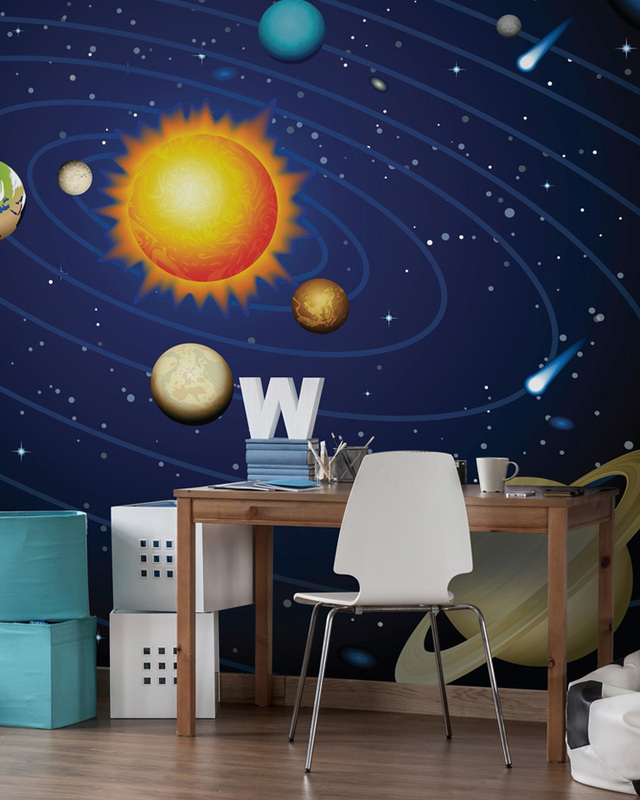 Whether you’re decorating a nursery for a new arrival or redecorating to keep up with your boy’s latest hobby, we have plenty of wall mural designs for boys including wildlife, gaming, sports, space and sci-fi. A wallpaper mural will create a fabulous feature wall and as your child grows from a young boy to a boisterous teen you can easily replace it with something new and more appropriate. There are plenty of ways you can make your boy’s bedroom stylish and you can have heaps of fun decorating his room with him and make it a team effort. 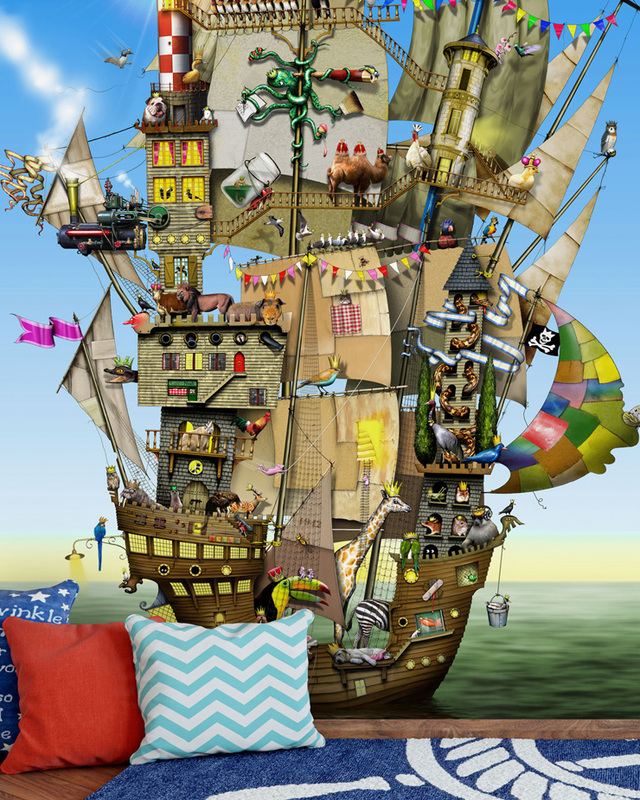 You can pick out the perfect wallpaper mural together and buy the coolest accessories to match his awesome wall mural. Create a cool space that your son will absolutely love with a wall mural with the help of our do’s and don’ts for choosing the right wallpaper. When choosing a wall mural for a feature wall it’s important that you take the rest of the surroundings into account. If the room already has storage units, duvets and accessories that you aren’t replacing then pick a wall mural that will go with the existing colour theme rather than against it. For example, if the bedroom has wooden furniture and shades of bright blues and greens then pick a wall mural that has the same colours in it. The size of a bedroom is extremely important when it comes to picking the right wall mural. If your son has the small box room then be bold with striking wallpaper and complement it with neutral bed linen and accessories so the overall décor doesn’t look too busy in the small space. However, if his room is big and spacious then you can play around with colours and textures while bringing the room together to make it cosier. Include some complementary accessories in a different colour to create a cool contrast in the room. Although wallpaper murals are easy to install and take down you still want to get a good use out of it. So if you’d rather get five years use rather than five months out of your chosen wall mural it’s best to opt for something timeless. By that we mean don’t be tempted to decorate the room based on a particular trend or TV show. If your son loves animals for example then a generic mural related to animals will last a lot longer than something like a Peppa Pig wallpaper. When he’s five he may very well love the TV show but fast forward to 10-years-old and he won’t want to invite his friends over with that wallpaper in his room! So play it safe with your wallpaper mural while also listening to what he likes. If you’re decorating a bedroom for a newborn or a toddler then it’s fair to say you can decorate the room as you please. However, for young boys and teenagers, the last thing they want is their parents going all interior designer in their personal space. Inevitably decorating your child’s bedroom will bring out the inner child in you, however, remember it’s not YOUR room that you’re decorating and give your son the chance to be creative and pick out the designs he likes. 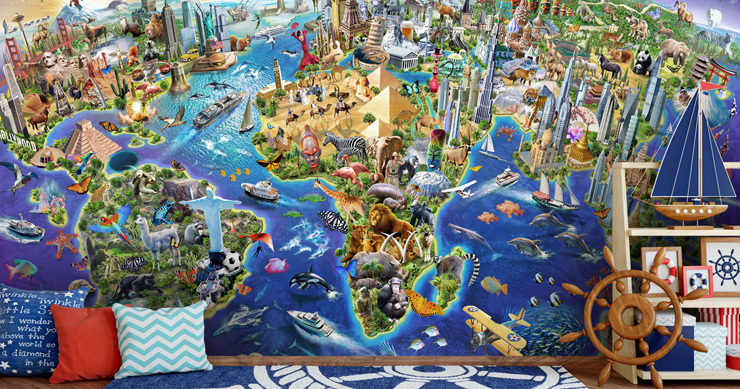 You may get tempted (or persuaded by your child) to cover all four walls with a mural. Don’t do it! Your son’s taste in wall mural will change just as fast as his taste in trainers. So save yourself the hassle of moving all his furniture and taking down the wallpaper from all four walls, when you can just decorate one wall as the feature wall and still create a super cool vibe in his room. If you’re happy with redecorating every two years then go for it! But for those parents who have opted for a timeless wall mural design, you’ll probably want to stick to one feature wall too. If you’ve never decorated a feature wall then be sure you don’t just stick the wall mural on any wall. A feature wall should be used to highlight the room's existing focal point. For example, in a bedroom, the wall behind the bed’s headboard in is usually the best for a feature wall. The whole point is that the eye should be drawn to one particular spot in the room and if the feature wall is anywhere other than the focal area it can look unflattering, to say the least. 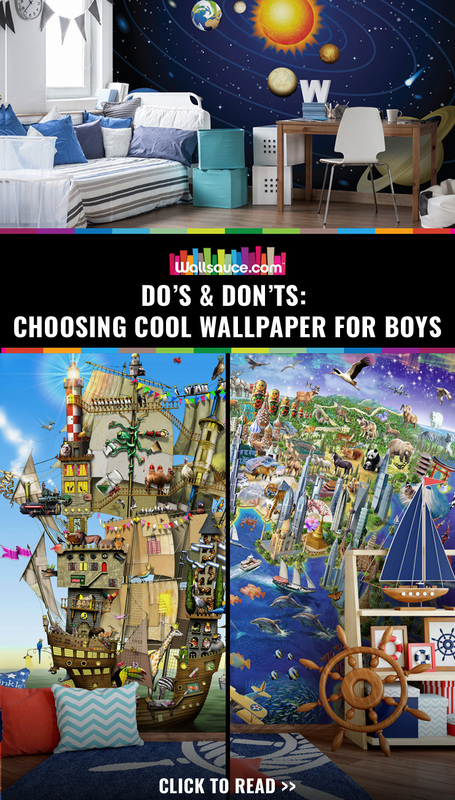 We hope our list of do’s and don’ts for choosing a cool wallpaper mural for boys has helped you decide on what to go for. All of our children’s wall murals are made-to-measure and are available to order in three different types of wallpapers: Classic 'Paste the Wall' Mural, Premium 'Paste the Wall' Mural and Textured 'Peel & Stick' Mural. If you need more inspiration or simply want to see what other murals we have for children then check out this blog post on children's walls. Alternatively, if you have picked out a few wall murals but can’t finalise which one to go for then you can order a sample for a small fee. We can print the sample in the wallpaper material of your choice too and if you go ahead and place the order with us the fee will be refunded. Please contact our team if you want to arrange any samples. 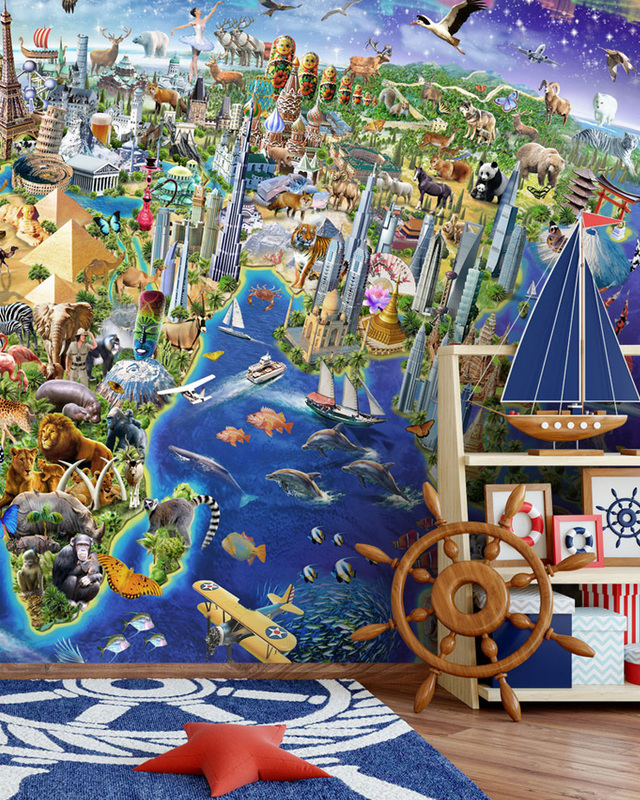 Have you decorated your child’s room with a wall mural as a feature wall before? Share any useful decorating tips that helped you in the comments below. My son is going to love these! The detail in Norah's Ark is unbelievable!